Authenticity: it’s treasured, but in short supply. 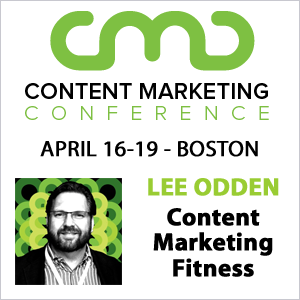 TopRank Marketing CEO Lee Odden had it right when he wrote recently that trust in marketing is at risk. The statistics speak for themselves: Edelman’s 2018 Trust Barometer reflects a general lack of credibility for businesses, and one poll from HubSpot found “marketer” to be among the least trustworthy professions. The commonality among occupations ranking at the bottom of that HubSpot list (marketer, car salesman, politician, lobbyist) is that they all have perceived agendas and motives. 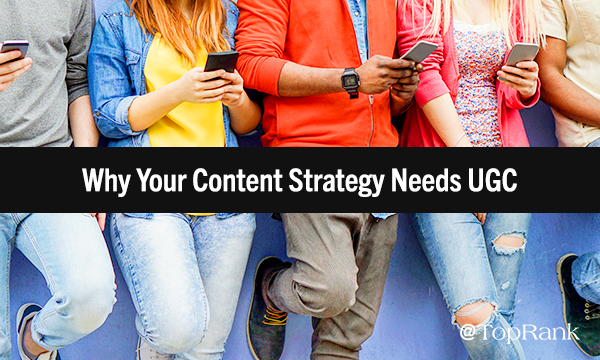 This is where the unique value in adding user-generated content (UGC) to your content marketing strategy lies. Even the most well crafted and relatable content is inevitably viewed through a certain lens when it comes from a brand. Developing a genuine rapport with your audience takes time, and even then, there’s an inherent recognition that any public-facing message from a company is strategic and carefully positioned. User-generated content offers a method to overcome this disconnect, by amplifying the voices of real people and actual customers. If your content marketing goal is authenticity, there’s no better bet. As we see, folks are far more likely to trust content from a company they already patronize (60%) than one they don’t (31%) — not surprising, but also not great for businesses looking to attract new customers. Ranking well ahead of both those sources, though, is “People like me” (66%), an option that’s second only to “My friends and family” (71%). It only makes sense that a person would put more stock into the opinions and viewpoints of someone similar to them, especially where buying considerations are concerned. Global research from Nielsen famously showed that 92% of consumers trust peer recommendations over ads and branded content. This is why customer testimonials and case studies are so powerful, but such material sits toward the bottom of the funnel. Prospects are unlikely to encounter it unless already along the purchase path, or actively taking an interest in your brand. The beauty of user-generated content is its function as a top-of-funnel asset for building brand awareness in an authentic and real way. Storytelling is one of the most essential tactics in content marketing, and customer-centricity is among the discipline’s central tenets. UGC presents a way to merge these two by actually making turning your customer into the storyteller. Not only is this an extremely engaging role for the individual whose content is featured, but it makes that content vastly more relatable for those consuming it. Once others start noticing the presence of user-generated content on your website, blog or social media feeds, it can cause a contagious effect. In general, people like to participate in trendy or connective ventures, especially if there is a compelling and creative hook (Ice Bucket Challenge, anyone?). For example, social media management platform Buffer introduced the #BufferCommunity hashtag on Instagram and receives regular submissions from all around the world. The content – which is frequently regrammed on the company’s official account, with credit – isn’t promotional, but it’s not supposed to be. It brings the product’s users together and raises general awareness for the brand. As we often preach here at TopRank Marketing, visuals are essential to content marketing but often difficult to produce with limited resources. UGC is primarily visual in nature so it represents an easy way to strengthen this dimension of your content mix. Plus, when regular people see other regular people in photos or videos, rather than models or actors, it adds to that relatable authenticity factor. Currently, photos and videos are the most popular forms of UGC. Fifty-four percent of adult internet users regularly create and share photos and videos, according to Pew. Photos are also the most common form of UGC created by Millennials, according to Statista. In either case, licensing user-generated content tends be less expensive than producing it professionally in-house. 1. Invite social media users to post about your brand, and curate those posts on your own feed or embed them in relevant content. One of my favorite examples of UGC is the @SlackLoveTweets Twitter account, which chronicles posts about Slack* from raving fans. Not only does this allow the brand to broadcast genuinely glowing remarks about its product, but the tweets can also be used elsewhere. 2. Run a contest that incorporates your product or service in a creative way. Everyone loves a contest, especially if there’s a fun twist. Say your company sells apparel; you could prompt customers to share pictures of their cats wearing (or sleeping on, or hopelessly entangled in) your t-shirts, with the winner earning a freebie. If the promotion catches on, not only you will end up with a bounty of great content to share on your social accounts or elsewhere, but you might even sell some extra t-shirts to people who are adamant about sharing pictures of their cats online (which, by my calculation, is roughly 95% of internet users). 3. Crowdsource opinions and perspectives for your blog posts. In the past, I’ve talked about the power of social media polls, which can allow your audience to become active participants in directing your content. The same concept can be applied with UGC. If you have an engaged social following, and you’re writing about a topic important to them, you could ask for their opinions and then round up the responses in a blog post, alongside stats and analysis. By no means should UGC be viewed as a replacement for the high-quality content produced by marketing professionals, but it can absolutely be a helpful supplement. 4. Turn customer reviews into testimonials on your website. There’s nothing wrong with enlisting a happy customer to cooperatively produce a testimonial advocating for your product or service. But organic reviews — appearing on neutral websites or social media channels — tend to come off as more earnest and unbiased. You could find a few positive ones and turn them into testimonials on your website or post on your blog (with the author’s permission, of course). In fact, if you’re really feeling bold, you could take a negative review from one of these sources and honestly address it. Ready to Get Down with UGC? The advantages of UGC are tough to argue: it is relatively inexpensive, community-driven, and highly customer-centric. But at the end of the day, it all comes back to that crucial imperative: authenticity. Letting actual people become the voice for your brand is as real as it gets. But it’s not a simple matter of snapping your finger and making it happen. In order for UGC to work, you need to build it into your overall content marketing strategy, develop clear objectives around it, incentivize submissions, and – above all – foster an enthusiastic following that is excited to talk about, participate with, and advocate for your brand. For inspiration to get you started, check out these examples of B2B user-generated content in action. *Disclosure: Slack is a TopRank Marketing client.